London is a dramatic setting for mystery books, starting with the adventures of Sherlock Holmes and Dr. Watson. 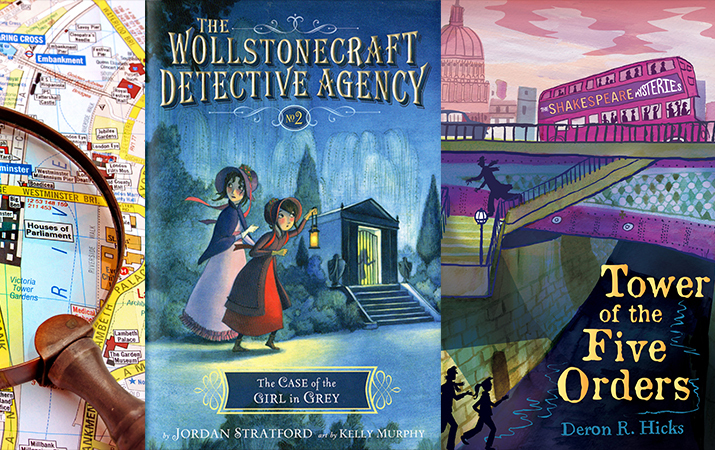 Here’s our list of new and favorite children’s mystery books, from intrigue in the court of Elizabeth I and Shakespeare’s legacy, to daring detectives in Victorian London, and contemporary adventures in the city. Our newest series is the Wollstonecraft Detective Agency, with principal detectives Ada Bryon (math genius) and Mary Godwin (author of Frankenstein). More than just a mystery to solve, it’s stories about science, books, people who changed the 19th century world, filled with word-play and imagination. Clever girls Ada Byron and Mary Godwin form the Wollstonecraft Detective Agency, and with the help of Charles (Dickens) and Peebs (Percy Bysshe Shelly), search for a stolen heirloom in The Case of the Missing Moonstone. Original and fun! Ada and Mary have other mystery to solve in The Case of the Girl in Grey. A ghostly girl, nefarious engagement, hidden identities, the broccoli uncle, a code in the crypt, something is very fishy. Xander and Xena, brother and sister, are descendants of Sherlock Holmes, and they have the famous detective’s notes of unsolved cases. Their first mystery – find a painting that disappeared a hundred years ago and who is the person in the portrait? Imagine if Sherlock Holmes had a younger sister, and here she is, Enola Holmes, a spirited teenager, hot on the trail of Viscount Tewksbury, as well as her mother, who’s also disappeared. Enola solves the ciphers, disguises herself as a widow and embarks on a London adventure. “How Princess Victoria became Queen with the Help of Her Maid, a Reporter, and a Scoundrel.” Based on real historical events, Princess Victoria and her lady’s maid Liza Hastings outwit evil Sir John Conroy, who want to take control of Victoria, the future Queen of England. After solving the mystery of Secrets of Shakespeare’s Grave, Colophon Letterford and her cousin Julian are off on another exciting adventure. An inscription on an ancient inkwell leads them to a portrait of a playwright, coded message on a wooden ceiling in Oxford, to the sewers of London and a priceless treasure. The New Cut Gang detectives (boys and girls) are keeping watch in London, as they track down the crook who’s passing counterfeit coins in the neighborhood and find who stole all the silver from the Gasworks. Funny and original Victorian London adventure. In the first mystery, Lady Grace, a Maid of Honour to Queen Elizabeth I, has to choose between three suitors. But in short order, one suitor is poisoned, the other is tossed into prison, and the third has disappeared – how to find the assassin? Lady Grace investigates the kidnapping of a young woman kidnapped, by it appears, none other than Sir Francis Drake in the second adventure. Ingenious historical mysteries set in Elizabethan court life. Mary Quinn, an orphan in Victorian London, is educated at an usual ladies academy, and takes a job as an operative for the Agency. On her first assignment, she goes to live in a household of a wealthy merchant, suspected of smuggling goods from the Orient. For Ted and his sister Kate, their favorite thing to do in contemporary London is “fly the eye,” ride the giant ferris wheel. But when they take their cousin Salim to the London Eye, he disappears without a trace. Ted and Kate follow a trail of clues all over the city to find Salim, before it’s too late.